will deliver this class twice a month from this month. 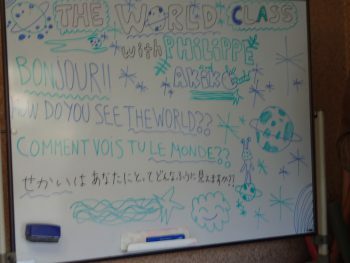 In the first world class, we all drew pictures of "How I see the world" and shared among the class. The world divided by continents and countries or nationalities and ethnicities is not the only world. In this world, many many different forms of the world exist unlimitedly...the world visible, the world invisible, and the most preciously the world that exist inside you! 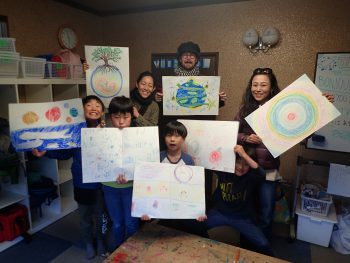 The class drew without any instructions of what kind of world to draw. The finished draws were all unique and personal expressing their own world. Some draws sharply depicted the human world of today and impressed us the adults. Next week, Philippe will invite us to the world of "the spirits of the forest" with clay workshop. Throughout this year, we look forward to enjoying our Quest for the New World with you all!